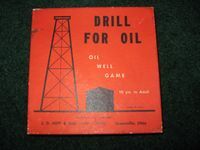 Drill For Oil is a game where players can enjoy the fun and excitement of drilling for oil as in real life. One player is elected banker. The banker issues $10,000 to each player. (The banker is considered a player as well.) After unfolding the board, the banker shuffles the 10 drill for oil cards and places one face down on each site. To drill for oil, it costs $10,000. The banker goes first, and must state which oil well he wants to drill for oil on. He must then appropriate $10,000 to drill. There are 10 stock certificates representing 10% ownership in a well being drilled. The player drilling may sell all the stock or part of the stock. He must, however, offer a percentage of stock depending on the amount of players. (50% for 2 player, 60% for 3 or 4 players, 80% for 5 players.) At times a player may have to buy all the stock in a well if no other players want to invest in it. After the $10,000 is raised, the player pays the bank and flips the card. If it says dry hole, the stock is worthless. If it says have struck oil, each player who invested receives the dividend stated on the card. (Amounts vary on 6 of the cards, 4 are dry holes.) Play continues to the left until all 6 oil producing wells have been drilled. The game then ends and the player with the most money wins.